THE POLITICAL landscape is changing and fast. Garning for recognition. His Majesty King Bryce Mthimkhulu III, ARU’s leader will contest 2019 national elections. With 2019 national voting elections fast approaching, South Africans will wake up to news that a new political party has been born and guess what, it will contest the elections. African Renaissance Unity (ARU) led by His Majesty King Bryce Mthimkhulu III who is from KwaZulu-Natal (Eshowe), according to insiders, will lead the party that represents Traditional Communities and Traditional Leadership in SA. ARU’s main mandate is to restore the dignity of its people and give them the chance to heal and prosper. According to a press information, ARU undertakes to deal with the colonial syndrome which has been inflicting pain and suffering on’ our people’. “Successive governments of the new dispensation have failed for more than two decades to bring the hope of a restorative, egalitarian and non-sexist society as enshrined in the Constitution. These successive governments have been dented by corruption, nepotism, incompetency, plundering the resources and the wealth of the country, and on top of that they have been colonial exigencies. Says His Majesty King Mthimkhulu III: “We will be involved in nurturing South Africans from birth to empower all our citizens to become productive and competent partners in capacity building (capacity building means all economic sectors in this global village which is equipped with advanced technology). ARU undertakes to find solutions to look after the elders and vulnerable people. ARU is empowered by a think tank which is setting various short, medium and long-term policies to address all the challenges facing our people and restore the damages of apartheid and the successive governments thereto,” says the King, whose party was formed December 2017. • admits that the role of leadership positions within institution of traditional leadership as pronounced in the Act has been limited for two decades. 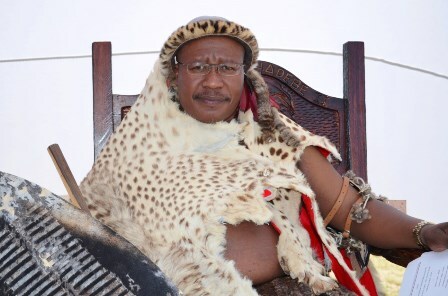 In 2016, the KZN Provincial Government and the department of Co-Operative Governance and Traditional Affairs, prevented Mthimkhulu to stop calling himself the King of AmaHlubi. Former President Jacob Zuma nor Premier Willies Mchunu did not recognise him “in any capacity as either inkosi or the king”. The then acting Judge M Monyemore of the Pietermaritzburg High Court issued an interdict against Mthimkhulu. Fast forward to now, according to a source close to the King, he was cleared of all charges in January 2018 by the same Pietermaritzburg Court. One Response to "King Mthimkhulu III cleared by court and starts a new political party ARU that will contest national elections in 2019"
Congratulations on your new party. I wish you all the best!